Mike: So we finally arrive in Cusco after flying from Iquitos to Lima then on again to Cusco. Cusco immediately looks nice, all the streets are clean there are no car horns and the buildings are all intact with big old spanish-looking plazas. We get to our hostel (Pariwana) and check in. The hostel looks great, we have a dorm room that looks out onto a court yard filled the tables, bean bags and a ping pong table. Upstairs they have a film room and a bar and big screen (where I watched the Peru vs Columbia football match, Peru lost). We explore Cusco over the first few days, helped by a free walking tour we did that took us all around the city showing us the coolest places, bars and shops (including a modern art museum that incorporates a bar into the art, apparently favoured by Mick Jaggar...cool). We meet someone in the hostel and we go out to a bar called Muse which was a small upstairs bar with one young guy on electric guitar orchestrating a sing-along to The Beatles, Bob Marley and others, they then randomly bring out a belly dancer, apparently later in the night they also brought out acrobats, but unfortunately we missed it. In Cusco I also got to try Cuy nuggets (Guinea Pig nuggets) and Alpaca. Alpaca was really nice, Cuy nuggets are not nice.....at all....in any way. 4 days into looking around Cusco and it´s the evening before we leave for the Inca Trail. We have paid up, rented our equipment and gone to a pre-trail briefing where we meet the rest of the people coming on our trip and get a run down on what to expect from our guides (Eddi and Herlin). We didn´t get much sleep that night partly because there was some guy in our dorm who kept having nightmares and then 2 separate people arrived throughout the night in the least stealthiest way possible. However, we get up ready for pick up at 5:20. Everything packed and ready to go. Herlin comes to meet us, we then walk all our stuff over to office where we can store our bags and anything else we aren´t taking on the Trail. It seems to be that we are one of the only people that didn´t rent a porter, which means we have to carry around 9kg each more than everyone else. Nothing like a challenge I suppose. We jump into the van for the 2-3 hour drive to the start, along the way we stop off for breakfast and to buy provisions. We reach Kilometer 86 which is the official start of the Inca Trail and all the people for that day are in 2 big queues, 1 for the tour groups and 1 for the Chatskies (this is prefered term for porters) who are small Peruvian men with massive bags on there back, easily bigger than they are. After queuing for a while we all pass through the check point and get our passport stamped, head over a small bridge and start the inca trail which is immediately uphill. Our first day in hindsight is realitvely easy but it took a while to get used to the amount of walking and the weight on our back (not helped by the fact I had stupidly got sun burnt on my shoulders a few days before) as well as the rain, which although wasn´t particularly heavy, was constant throughout the day. We pass from river landscape that is fairly barron to forest, stopping for regular breaks and even a snack. We reach the lunch spot at around 12:30(ish) where a big tent is already set up for us and fresh food has been prepared by the chief and other Chatskies. The give us a lot of food and it´s a good chance to get to know some of our group. After lunch the rain breaks and we head up the hill towards our campsite that we will reach around 6. On the way we walk up to the top of a steep incline, when we reach the top Eddi tells us all to stop and stand in a line holding hands. He then tells us to all close our eyes and walk forward, we are a bit unsure as the ground isn´t that even and we can see there is a steer drop into the valley below us. He tells us this is a trust exercise and they will tell us when to stop. So we close our eyes and start walking forward. We stop a few times by ourselves when we think we are close to the edge but Eddi and Herlin tell us to keep going. They finally say stop, then they tell us to open our eyes. We open them are we are stood at the edge of the valley and below us is our first Inca ruin. It´s a massive structure a little way below us over the other side of the valley, everyone simultaniously says "woooow", it´s very impressive and a really nice way to introduce us to our first ruin. We carry on walking for the rest of the day and the rain starts up again. Before reaching the first campsite, Alicia stumbles upon a herd of speedy llamas racing towards her on the narrow track. Only the yell of "Miiiiikkke" seemed to stop them. When we finally reach the campsite, our tents have already been set up for us by the Chatskies and food in ready. We have another really good meal before heading off to bed. This is Alicia´s first time ever camping so I am interested to see how she will get on sleeping on the ground with the mosquitos (for which there are many on the Inca Trail) and now driving rain. But we are both so tired we fall asleep without any problems. We get woken up by Herlin banging on the tents at 6am, we struggle to get up, partly because it´s early, partly because it´s still raining outside but mostly because we are really stiff from sleeping on the hard, uneven ground. He gives us a cup of Coca tea which is horrible at any time of day, but especially early in the morning, we try to drink it though because it´s supposed to help with energy levels and altitude. We get up and dressed for breakfast at 6:30 then head out. Today is the hardest and longest of the days when we have to hike up past the ominously named "Dead Women´s Pass" and down again before we can get lunch. Luckly the rain stops and we are left with grey clouds that roll lazily over the hills. The hike to the top is long and extremely difficult, especially without the help of an additional porter. The going is slow but we take regular breaks (at one point we got to see a Condor circling overhead) and meet people from other groups along the way as our group has split of into the speedy super-fit leading the pack in the distance with us and one or two others at the back. After around 4 hours we reach the summit at 4,400 meters above sea level. The view from the top is really spectacular. We have a breather, a group picture and some time to walk around the top and relax. After not-too-long we start to get cold so we all gather together to begrudgingly put our backpacks on and head down the hill which is a slope followed by 1000 steps. The downhill mixed in with the weight of the bags and muscle fatigue from the climb make going down pretty hard going, especially on the knees (I wore both knee straps for pretty much the entire trip). Around 2 we reach the bottom of the valley and lunch. During lunch Eddi points to the mountain on the other side of the valley as our afternoon activity and another 900 meters up. This is met by groans as we are all exhausted after the long and difficult morning. Some other groups are camping here for the night, which at that moment seems like a great idea but to give us an advantage over the next few days we push on for another afternoon. Whilst we are still walking the weather takes a turn for the worst and it starts hailing. This makes the trail slippery and pretty hazardous. It´s slow going from here. We do eventually reach an Inca Ruin just as the sun is starting to set, we get some time to look around and see some of the carvings of star maps and have a talk about some of the features of this particular Inca Ruin. As the talk continues we are lucky enough to see a double rainbow form above us; we can see the entire arch and the colours are vivid. Eddi says that rainbows were considered a sign from the Gods in Inca times so seeing two together is a very good sign. Hopefully this means it´ll stop raining for good. From the ruins you have a great view and you can look across the valley at the campsite in the distance. It seems like a long way to go and the sun is disappearing fast between the mountains. Although it´s a nice sight none of us fancy walking in the dark. We reach camp just as it´s getting dark, put our stuff in our tent, unroll our sleeping bags and liners and head off to dinner. I am looking forward to this evening as because of the altitude this is supposed to be the best place to see the Milky Way at night, plus because it is so close to the equator you can see the stars from the Northern and Southern hemisphere. Unfortunately tonight it is very cloudy and we can only make out around 4 or 5 stars. I am gutted by this, but as there is nothing we can do, we head off to bed. This is a half day. We leave around 6:30 am and head off. The rain has stopped and the weather is clearing up, although no sun just yet. We are told this is one of the most spectular days on the Inca Trail and because we made the extra effort to walk further on Day 2 we can see a lot of the ruins today without most of the people and spend longer looking around. On the hike we can see a small set of argricultural terraces in the distances which is going to be our first destination. We walk on for a bit and up ahead one of the american women slips, badly hurting her leg. Alicia takes a look at it like some physio Sherlock Holmes. She hasn´t broken anything but she is in too much pain to walk so Herlin has to piggy back her all the way to the campsite which is an incredible feat, unfortunately she´ll miss the terraces but at least this has happened near the end of the trek. It´s still another hour or so´s walk to get to the terrace, but when we finally arrive we turn a corner to see the terraces again and they are huge! Each level is easily taller than 2 of me and there are 10-15 levels or so cut into the side of this mountain. When we arrive we´re the only people there, we walk onto one of the middle terraces and look over the valley with probably the best view I´ve seen in my life (so far anyway). We sat high up and dangled our legs over the edge which, although there was many layers of terraces below, made it feel like you were sat on the edge of the valley with nothing around you. The sun had come out, so you had blue skies for the first time and people tried to make the "condor" pose for photographs by balancing on the edge of the terrace with one foot outstretch behind them and their arms out to their sides. Even though this wasn´t technically the most impressive place on the Inca Trail, this was probably my favourite place on the trek. We get to camp around 1pm - it´s massive as everyone on the Inca Trail (from all the different groups) have to camp at this campsite in the evening. But we are there before most people so we gather with the Chatskies and chefs and we all go around and each say our name and a bit about ourselves, the Chatskies ranged from 50-odd year old miniture men to some guy who had 12 children! It´s nice to finally put faces to names of a lot of Chatskies. Afterwards and we drop our stuff off (our tents are guarded by two stationed Chatskies), have lunch and head of to the Temple of the Rainbow. The Temple of the Rainbow is regarded by some people (including Eddi) as the most impressive place along the Inca Trail, better than even Machu Picchu. This is a massive temple and astronomical observatory is completely original and was the home to the most powerful king in the Inca´s time. We have a look around and meet near the top where Eddi and Herlin perform a religious ceremony. Eddi finds a stick and draws his story in the dirt (as he has done most of the way) about Pacha Mama and the need to take care of our planet. He seems to really believe what he is saying and it´s enthralling to listen to him. We place some Coca leaves in a heart shape that Eddi draws on the ground and all hold hands in a circle as Herlin fans us with Condor feathers and sprays us with flower water. When it´s over we have to go and hug everyone else in our group. It´s a nice way to end before we head off to Machu Picchu in the morning. We have a little time to walk around individually, but it´s getting dark and harder to see. So after a while we head back to camp for food and I brave a cold shower in what is effectively a tap placed high on a wall. After dinner Herlin, Eddi and the rest of the group take it in turns telling jokes and Herlin even pulls out a couple of ghost stories. It´s all very tongue-in-cheek and a good laugh. Eddi at the end also tells us a story of how last year he got called to a rescue attempt at the top of one of the highest points in the valley (5,200 meters above sea level on a mountain), only to find that she was dead when he got there and then had to walk her boyfriend back down the mountain in the middle of the night). It was a solomn way to end the story telling, but was an incredible story. After this we head back to our tents to arrange tips for the porters and chefs. By now it´s pitch black with a completely clear sky (finally!) so after we have given the porters and chefs our tips as a group, Eddi, 2 American girls, another British guy called Tom and I head back to the Temple of the Rainbow to go to the observatory section and look at the stars. It´s truely special. I have never seen so many stars and you can even see the different shades of grey and black in the sky. You can see the Southern Cross and "The Great Llama" which is basically the Milky Way. Time to head back though, as we have to be up early tomorrow to enter Machu Picchu. We get up at 3:30 to have a quick breakfast, yet more Coca tea and start queuing. They don´t let us in till 5:30, but due to the amount of people we are told it´s best to start queuing early. We pass the time by looking at the stars again and can see shooting stars now as well. When we start walking it´s just after 5:45 and another 1:30 hours until the Sun Gate as we have to get to the otherside of Machu Picchu mountain. We are racing to get there before the sun rises (because of all the mountains the sun doesn´t hit Macchu Picchu till between 7 and 7:30), but unfortunately so is everyone else. Everyone is generally good natured about it as the path is quite small, but no one is hanging around either. After what seems like a long walk through the jungle we reach what the porters and guides call the "Gringo Killer". This is right at the end but is an extremely steep set of tall, worn steps. In fact it´s so steep that we have to crawl up them on hands and feets, not made easier by our big bags. But both Alicia and I reach the Sun Gate at the top in time, although it´s not what I expect. I thought it´d be some grand archway signifying the entrance to Machu Picchu, but it´s actually a couple of ruined buildings overlooking Machu Picchu. This is our first glimpse of Machu Picchu though and we have our photos taken as a group over looking the valley and stand to watch the sun rise light up the valley bit by bit until it reaches Machu Picchu. We then put our bags back on for another 45 minute hike to get down to the city itself. When we get to the bottom there are already a significant number of clean, well-rested tourists (gits!) already milling around. 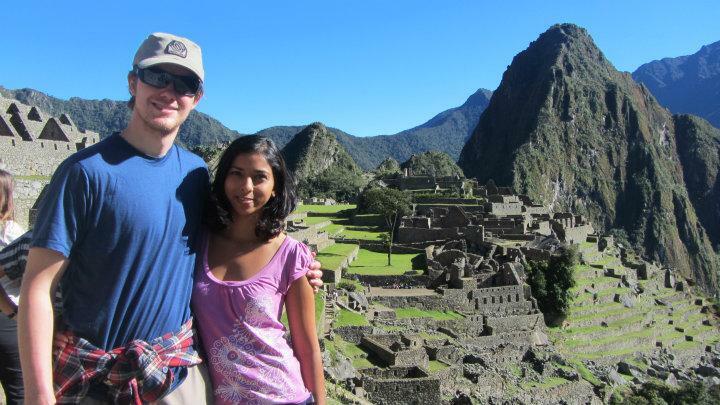 But the first thing we have to do when we reach Machu Picchu, is to leave Machu Picchu. We put our bags into storage, which is actually a treat in itself having them off our back, then we head back into the ruins to have a 30-40 minute guided tour taken by Eddi. We get to hear about a lot of the history surrounding Machu Picchu, the discovery, which sections are original and which were rebuilt and see some of the important rooms. It´s extremely interesting but all over a little too quickly as there are so many rooms and interesting hidden corners in Machu Picchu that it feels like it could have gone on an hour more and still not have covered everything. This does however give us some time to go exploring ourselves. One of the first this we do, along with a couple of other people in group, is head up the steep steps to the top of Machu Picchu to the Guard Tower so that we can head over to an old Inca Bridge. At the top of the steps we the best views from Machu Picchu, the classic post card shot, but it isn´t advertised and because it´s a bit of an effort to get to a surprisingly large amount of people don´t bother. We continue onto the bridge which is around 1 hour each way going away from Machu Picchu. The walk is nice, but the bridge itself was really disappointing. It´s just a hole in the path which we can´t even get close to as it´s blocked off. So we head back. When we return we then have the rest of the morning to walk around Machu Picchu, take pictures and enjoy our reward after 4 days of hard hiking. We see a sun dial which if you touch, is supposed to give you powers, although they don´t let you touch it....spòil sports.... We pet some Llamas and see a bird of prey that was sacred to the Inca´s flying low over head. There was a little more to see but it was coming up to 1pm and this was the time of our bus down the mountain to Aguas Calientes (a small town that serves as a stop off point for people between Cusco and Machu Picchu). We head out to collect our bags from the storage area and get our passport stamped, just to prove we were there). After a queue for the bus and then a 30 minute or so very wiggly journey down to the town, we arrive in Aguas Calientes, check into our hostel and have some lunch. After lunch we say our farewells to Eddi and Herlin as well as the rest of our group that are heading back to Cusco that day. Only 4 others from our group decided to buy the extra night in Aguas Calientes, but by luck it was probably the 4 we were closest with on the trek (an English and an Australian couple). We leave our stuff in our room and head out to the local hot springs (Aguas Calientes means "Hot Waters" in Spanish), which we are really looking forward to after the hike. The springs are nice, although they resemble a series of very small swimming pools and even though there are many pools the water that resides in them are all an odd yellow, so gringos and locals alike are all in the only clean looking pool. We decide to join them. It´s a great temperature and we were able to sit, chat, relax and drink a few beers and cocktails whilst in the water. It was a great treat after the week. Although it was worth noting that there was one gringo with the worst sunburn I have ever seen in there. He was peeling. He also thought it´d be fun to peel big chunks of skin off himself and throw it at his mate. We wern´t thrilled by this at the time, but it didn´t spoil the fun. We got out after a few hours smelling slightly of sulphur and head back to our hostel. The plan was to eat, use their 24 hour hot showers then head out for the local bar deals (4 drinks for the price of 1). What actually happened was, we ate, Alicia had a cold shower whilst I didn´t bother (had a shower yesterday) then we were all so tired, we slept. Party on. In the morning we all get up and meet downstairs for breakfast, check out and head to the train station. We have to get a train from Aguas Calientes to Ollaytaytambo then get a bus or taxi from there back to Cusco. The train was really nice, the views where great we got nice seats and a free drink, when we got off we split a taxi and headed to Cusco. When we arrived in Cusco we were in a rush to get our gear back before 1pm as we´d have to then pay for another day, also, and more importantly we had worked out (and asked in local bars the day before) that the England football match was at 2pm. We had arranged to meet a lot of the people on the Inca Trail in an Irish Pub with Sky sports so we could watch it. We rushed from shop to shop and had got our main travel bags out of storage, so ladened with all our stuff, we got a taxi to our new hostel which was a reasonable way out from town. We hurriedly checked in, but the room wasn´t ready. After much feet tapping and asking "is it ready now" we dumped our stuff in the newly readied room and headed quickly into town (around 15 minutes very brisk walk). We were late but we got to into the pub in a sweat and out of breath. We looked around only to find a couple of our friends and no football. It turns out it was at 11am that morning. Not best pleased, but at least our Swedish friend could watch the Sweden game that replaced the respective England match. After such a rush we decided to console ourselves by buying cider. Cider is particually unheard of in Peru and this bar had imported Westons Organic. At the bargain price of 25 Soles (around 7 quid). We didn´t care though. Alicia and I split the cider and we ended up staying in the pub drinking, playing darts and pool till around 6. Afterwards we met up with some other trekmates and headed over to a very fancy Pisco cocktail bar (having not had the chance to change from our trek clothes, we must have looked completely out of place). We ended a great night, budget completely blown, but it was a great way to round off an unforgetable week.